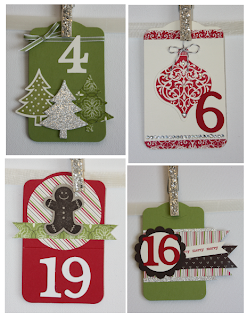 Welcome to the Artisan Design Team's Blog Hop for the November Facebook projects! You should have just arrived from Wendy's blog. 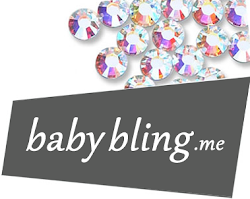 If not, make sure you go back and check out the beautiful banner that she created for her mantle, it's amazing! 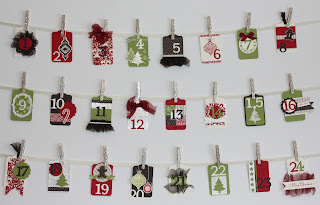 For this months Facebook project I created an advent calendar. The colors from the Candlelight Christmas Designer Series paper along with the Silver Glimmer Paper were the starting point for the calendar. 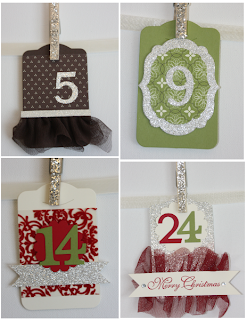 I embellished a tag for each of the days in December using the Ornament Keepsake and Scentsational bundles. I have a canvas above my buffet in the dining room that is blank. I am planning on painting something, I just don't know what yet. So far the canvas has had giant flowers, giraffe print fabric and now an advent calendar on it. I might just leave it blank and change it up all the time! 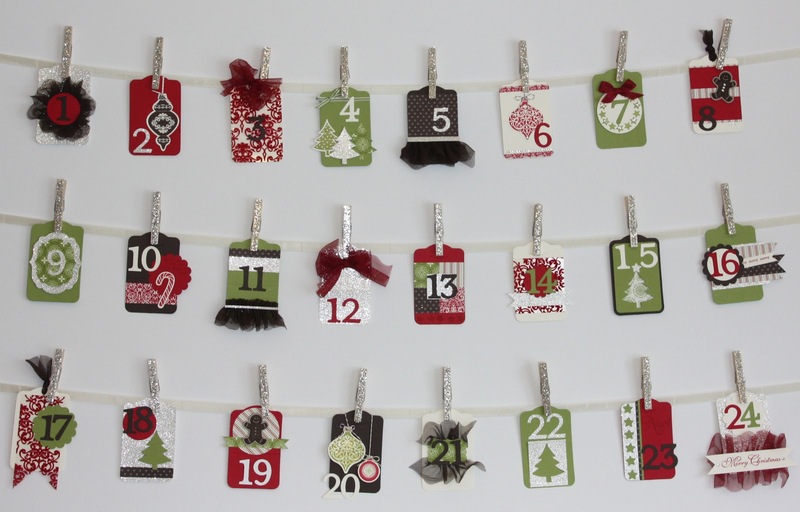 This advent calendar is a little bit different than most calendars. Instead of giving a candy or chocolate each day, I printed labels that are on the back of each tag. Each one lists an activity or something we can do together that day as a family. So far we have done, 1) Gingerbread house, 2) decorate your tree, 3) choose a treat, 4) bake cookies, 5) make a list for Santa, 6) Movie night with popcorn. There are lots of really fun ones coming up - tobogganing, read a Christmas book, set up Playmobil nativity, make a gift for your teacher, a Lego mini figure, drive around and look at Christmas lights, wrap gifts, make a Christmas craft, take a family picture, donate 3 toys to charity, read the Christmas story, and a whole bunch more. Each tag is held to a piece of Very Vanilla seam binding ribbon with a clothespin. The clothespins have a little bling added to them, I used a piece of sticky strip and Silver Glass Glitter. Thanks for stopping by and I hope you enjoyed my November project. Please continue on to Cindy's project, a gorgeous card using a faux patina technique! 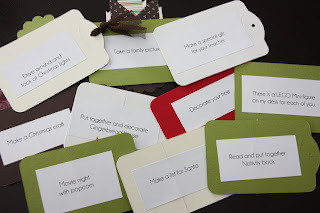 Not only are your individual tags amazing, but what you decided to do instead of candy....fabulous idea and I'm sure your family will enjoy these ideas much more than candy! Thank you for sharing....wonderful ideas!